“He looks good and we are very happy with how he has wintered. He is a great horse to have in the yard and we are looking forward to getting him started at Naas. The aim will be in to win a Group 1 race with him this season. He is a huge big horse and he only ran once as a two-year-old so we’ve always hoped that he would make into a real nice four-year-old. 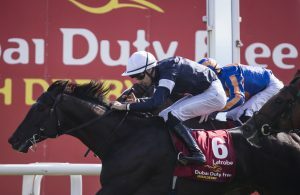 Maybe later in the year he could end up heading for a Caulfield Cup or a Melbourne Cup or something like that in the second half of the season.” Commented Joseph O’Brien. There will be plenty of horses off the track also as Naas Racecourse will host ‘under stARTers orders’, a unique public arts display and fundraising initiative. Under stARTers orders have tasked 21 of Ireland’s top equine artists to each paint their own unique version of a life-sized resin fibreglass horse sculpture. The project was established to celebrate the redevelopment of the iconic Curragh Racecourse and aims to raise much-needed funds for Kildare based charities, Irish Injured Jockeys and Sensational Kids. The first of eight races will go to post at 1.50pm. Admission tickets are just €15 or hospitality packages are available to purchase at www.naasracecourse.com.